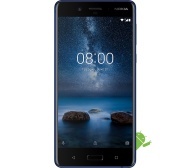 alaTest has collected and analyzed 75 reviews of Nokia 8 Sirocco. The average rating for this product is 4.1/5, compared to an average rating of 4.1/5 for other Cell phones for all reviews. Views about the portability and battery are overall positive. The camera and design also get good feedback, whereas the connectivity and sound get mixed comments. The price and screen get critical opinions. We analyzed user and expert ratings, product age and more factors. Compared to other Cell phones the Nokia 8 Sirocco is awarded an overall alaScore™ of 93/100 = Excellent quality. The Nokia 8 Sirocco is the best Nokia Android phone yet, but not exciting enough to justify the cost. The Nokia 8 Sirocco is fast, feels sturdy, has a long battery life and runs the sleek Android One operating system. It lacks any standout features to justify its premium pricing. The Nokia 8 Sirocco's camera isn't reliable enough, and its design, while improved over the regular Nokia 8, feels stout and a little outdated.